The Adler company built it's highly successfull line of thrust-action typewriters on an original design by US inventor Wellington Parker Kidder (see Empire for the early history), that was marketed in Germany as the Adler 7 beginning in the 1890s. 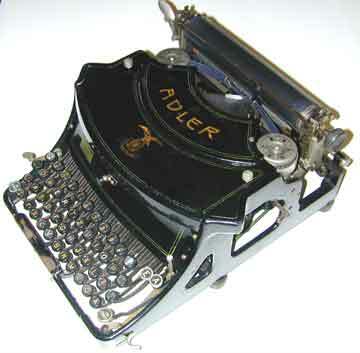 Adler soon went its own way in the further development of the thrust action typewriter. Adler introduced a small portable version (the Klein Adler and the Klein Adler 2) and a full sized office machine, the Adler 8, followed by several adaptations, including the Adler 11 with two double shifts and six characters on each type bar, so that it could write two different typefaces. The Adler 15 that is shown here was introduced in 1909 and was built until 1923. With four rows of keys and a single shift, this machine was only one huge step away from the intruduction of the regular front strike typewriters that Adler (or Triumph-Adler) would continue to produce until it went out of business in 1995. An interesting detail is that despite the many improvements that were made on the machine, Adler stuck to the clumsy line space and carriage return system on the side of the carriage that can be seen in picture 6.